Tax records show that a California charity accused of funneling money in a national college admissions bribery scheme claimed it gave out $500,000 to the University of Southern California. An Associated Press review of Key Worldwide Foundation's filings shows the Southern Cal contributions were part of nearly $2 million in grants in recent years. The foundation reported revenues that spiked from $451,600 in 2013 to $3.7 million in 2016. A message left late Tuesday at the school wasn't immediately returned. Foundation founder William "Rick" Singer pleaded guilty Tuesday afternoon and acknowledged using his company and charity in the scheme. A judge says actress Felicity Huffman can be released on $250,000 in a case in which she is accused of paying a bribe to secure her daughter's admission to college. A magistrate judge ordered the "Desperate Housewives" star to restrict her travel to the continental United States. Court documents say Huffman paid $15,000 that she disguised as a charitable donation so her daughter could take part in the college entrance-exam cheating scam. The documents state a cooperating witness met with Huffman and her husband, actor William H. Macy, at their Los Angeles home and explained to them that he "controlled" a testing center and could have somebody secretly change her daughter's answers. The person told investigators the couple agreed to the plan. Macy attended his wife's initial court appearance. He has not been charged and authorities have not said why. Four people arrested in New York City in the college admissions prosecution have each been released on $500,000 bail after brief appearances in Manhattan federal court. 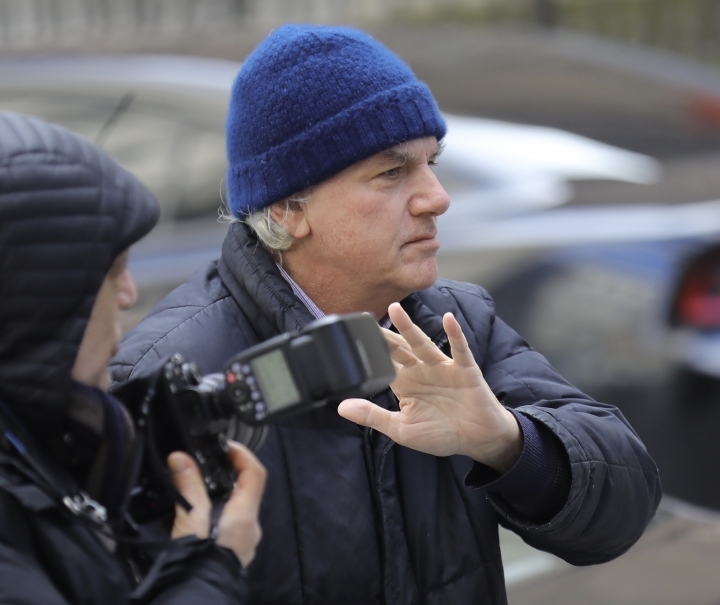 Lawyers for Gregory Abbott, Gordon Caplan, and Elizabeth and Manuel Henriquez declined to comment after their clients appeared before a magistrate judge to face charges of conspiracy to commit mail fraud and honest services mail fraud. A prosecutor had sought $1 million bail against Abbott, a New York founder of a food and beverage packaging company, claiming he was a risk to flee. Caplan, of Greenwich, Connecticut, is co-chairman of the Willkie Farr & Gallagher law firm, which has 700 lawyers in 10 offices in six countries. Manuel Henriquez, chairman of Hercules Capital Inc., shook his head repeatedly in court. Elizabeth Henriquez appeared distressed, repeatedly running her hands through her hair. The University of Southern California says it has fired two employees who were indicted in a bribery scheme that allowed wealthy parents to get their children into top colleges. The university said Tuesday that senior associate athletic director Donna Heinel and water polo coach Jovan Vavic were fired. The news came hours after the two were named in a wide-ranging indictment by federal prosecutors in Boston. Court documents say Vavic was paid $250,000 and designated two students as recruits for his water polo team to facilitate their admission to the university. USC says it is also reviewing its admissions procedures. Prosecutors allege Heinel also helped facilitate admissions after she was paid bribes. Heinel's attorney had no comment Tuesday. FBI spokesman Jason White says Vavic was taken into custody Tuesday in Honolulu. It's not clear if he has an attorney to speak for him. A lawyer for a consultant who admitted to running a nationwide college admissions bribery scheme says his client intends to fully cooperate with federal prosecutors. Attorney Donald Heller told reporters that William "Rick" Singer is "remorseful and contrite and wants to move on with his life." Heller says Singer is "relieved that this part is over." Authorities say parents paid Singer large sums to bribe coaches and administrators to help get their children into elite universities. John Vandemoer, the former head sailing coach at Stanford, pleaded guilty Tuesday to accepting bribes. His attorney, Rob Fisher, says that Vandemoer regrets that Stanford has been dragged into the case and that Vandemoer loved the school and its students. Fisher noted that Vandemoer didn't pocket any of the money he received in exchange for recommending prospective students for admission, unlike other coaches that have been charged. The money went to Stanford's sailing program. Actor William H. Macy has been let into a Los Angeles courtroom before his wife, actress Felicity Huffman, appears on a charge of paying a bribe to secure her daughter's admission to college. Huffman was one of about a dozen people taken into custody Tuesday in Los Angeles in a sweeping college admissions bribery scam. Court documents say Huffman paid $15,000 she disguised as a charitable donation so her daughter could partake in the college entrance cheating scam. Macy has not been charged; authorities haven't said why. Representatives for Huffman haven't returned a message seeking comment. Actress Lori Loughlin (LAWK'-lin) was also charged but was not taken into custody Tuesday. Her husband, fashion designer Mossimo Giannulli, was arrested at their home and is expected to appear at Tuesday's hearing in Los Angeles. The founder of an admissions consulting company pleaded guilty earlier Tuesday in Boston to running the scheme. 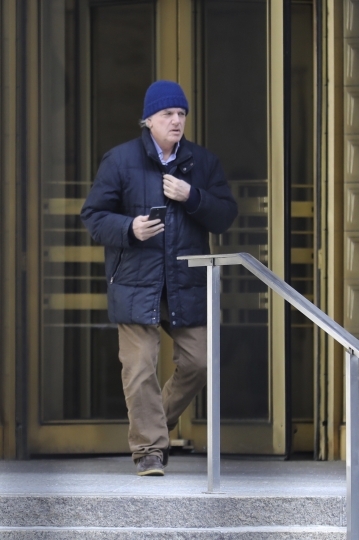 A recently fired Stanford sailing coach also pleaded guilty in Boston to accepting bribes. The former head sailing coach at Stanford University has admitted to accepting bribes to help get students into school by pretending they were athletic recruits. John Vandemoer was the second person to plead guilty Tuesday in the sweeping college admissions bribery scheme. He is charged with racketeering conspiracy. Authorities say Vandemoer conspired with an admissions consultant to pretend two prospective students were competitive sailors in exchange for payments to the Stanford sailing program. Neither student ended up attending Stanford. Stanford said Tuesday that Vandemoer has been fired. The consultant, William "Rick" Singer, pleaded guilty earlier Tuesday. 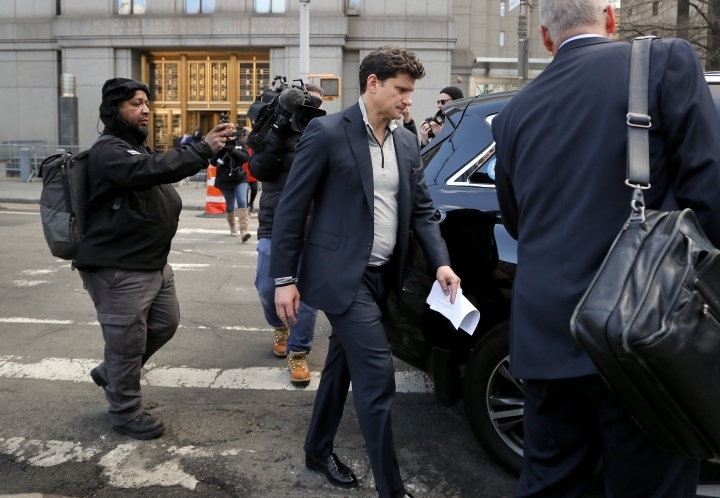 They are among 50 people charged in what officials say is the largest college admissions scam ever prosecuted by the Department of Justice. The founder of an admissions consulting company has pleaded guilty to running a nationwide college admissions bribery scheme involving wealthy parents and coaches at elite universities. William "Rick" Singer, of Newport Beach, California, pleaded guilty in Boston federal court Tuesday to charges including racketeering conspiracy and obstruction of justice. 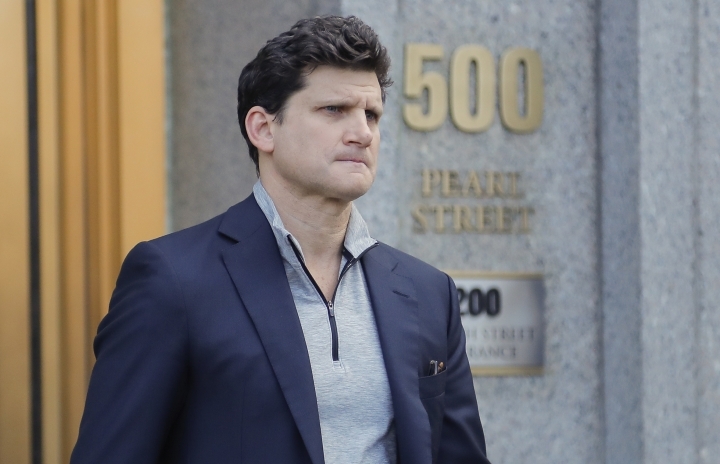 Singer is among 50 people charged in what federal officials say is the largest college admissions scam ever prosecuted by the Justice Department. Authorities say Singer schemed with parents, coaches and others to pay students' way into schools like Yale, Georgetown and Stanford University. Prosecutors say parents paid Singer about $25 million to bribe coaches and administrators into pretending that their children were athletic recruits to guarantee their admission. Stanford University says it has fired sailing coach John Vandemoer in a college admissions bribery scandal. Vandemoer was charged with accepting a total of $270,000 in contributions to the school's program for agreeing to recommend two prospective students for admission. The school said Tuesday that neither student came to Stanford but that "the alleged behavior runs completely counter to Stanford's values." Stanford said it has no evidence that anyone else at the school is involved but will conduct an internal review. Vandemoer is expected to enter a plea Tuesday in Boston. The NCAA says it will look into claims made against college coaches and administrators in the admissions bribery scandal. In a statement, the NCAA says the "charges brought forth today are troubling and should be a concern for all of higher education." Most NCAA rules that regulate recruiting are aimed at preventing schools and coaches from giving improper benefits and enticements to athletes. In this case, parents were paying coaches to help students gain entry to college by falsifying athletic credentials and claiming that the students were being recruited to plays sports. The NCAA says it is reviewing the allegations "to determine the extent to which NCAA rules maybe have been violated." The University of California, Los Angeles says its soccer coach Jorge Salcedo has been placed on leave pending a review and will have no involvement with the team. UCLA says in a statement Tuesday it's a "potential victim of a fraudulent scheme" but that it's not aware of any student-athletes who are under suspicion. Court documents say Salcedo, who was the head coach for the men's team, helped get two applicants who did not play competitive soccer into UCLA in exchange for $100,000 in 2016 and 2018. Authorities say nine coaches at elite schools were part of the scheme. Wake Forest University suspended its head volleyball coach following the sweeping federal investigation into admissions bribes. William H. Macy talked about his daughter's "stressful" college application process earlier this year. 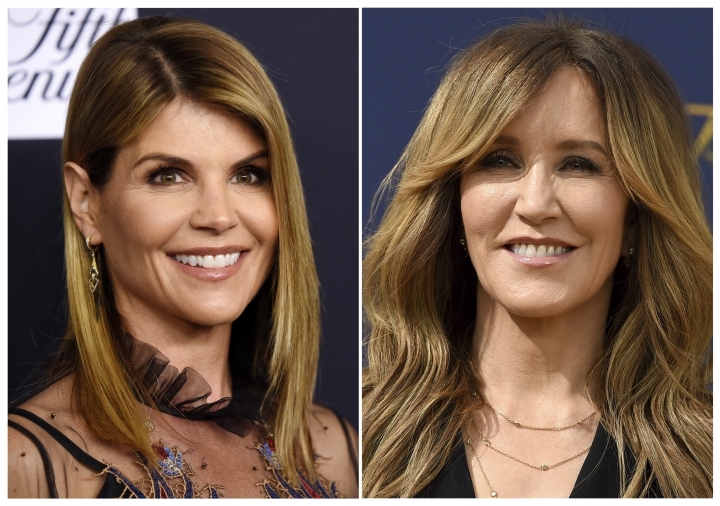 The actor's comments came two months before his wife, Felicity Huffman, was among more than 30 parents charged in a sweeping college admissions bribery scam. Macy said in the January interview with Parade magazine that his family was "in the thick of college application time, which is so stressful." Huffman was one of 13 people, including actress Lori Loughlin (LAWK'-lin), taken into custody Tuesday in Los Angeles. Authorities have not said why Macy wasn't charged. Authorities say it is the largest college admissions scam ever prosecuted by the Department of Justice. Wake Forest University says it has suspended its head volleyball coach amid a sweeping federal investigation into admissions bribes. The North Carolina school says it placed Bill Ferguson on administrative leave but declined further comment. Ferguson is accused of accepting $100,000 to recruit a student who had been on Wake Forest's wait list. Other coaches are accused of taking bribes to admit students at schools including Georgetown University and the University of Southern California. Prosecutors say the bribes were orchestrated by William "Rick" Singer, a California admissions consultant who is scheduled to plead guilty to charges including racketeering conspiracy. USC says it is reviewing any admissions decisions and payments tied to the case. Prosecutors say the investigation is ongoing but that it appears schools were not involved in the scheme. The FBI says 13 defendants in a college admissions bribery scam have been taken into custody in the Los Angeles area, including actress Felicity Huffman. Officials say initial court appearances are planned Tuesday afternoon. Actress Lori Loughlin (LAWK'-lin) is among those charged but was not taken into custody Tuesday morning. Her husband, fashion designer Mossimo Giannulli, was arrested at their home. Court documents say Huffman paid $15,000 that she disguised as a charitable donation so her daughter could partake in the college entrance cheating scam. Papers say a cooperating witness met with Huffman and her husband, actor William H. Macy, at their Los Angeles home and explained the scam to them. The cooperator told investigators that Huffman and her spouse "agreed to the plan." Representatives for Loughlin had no comment. 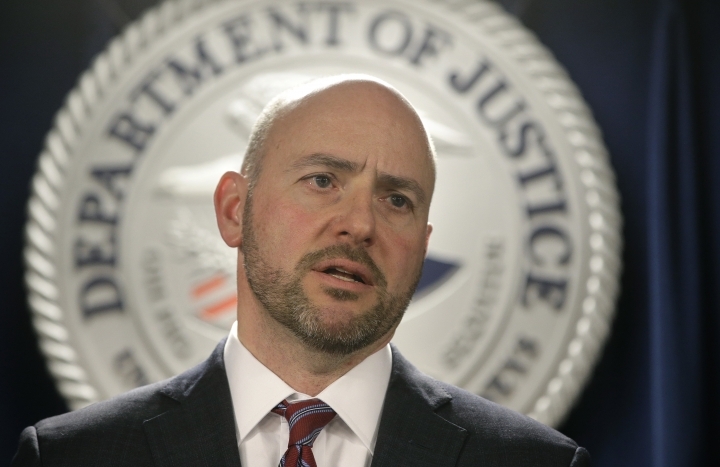 Fifty people have been charged in what federal officials say is the largest college admissions scam ever prosecuted by the Justice Department. 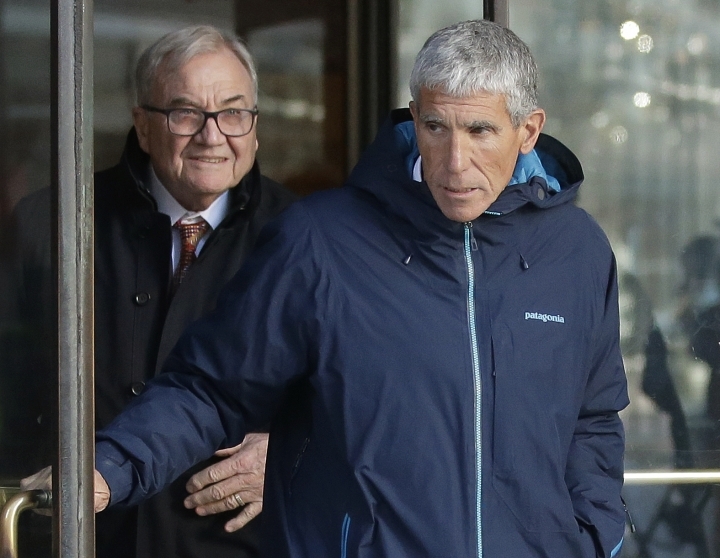 Among those charged are nine coaches of elite schools and 33 parents who prosecutors say paid "enormous sums" to guarantee their children's admission. Coaches are accused of taking bribes to admit students at schools including Wake Forest University, Georgetown University and the University of Southern California. U.S. Attorney Andrew Lelling in Boston said Tuesday at a news conference that the colleges are not targets of the continuing investigation. He says authorities believe other parents were involved. Court documents say an admissions consulting company in California was paid $25 million from 2011 through February 2019 to help facilitate the bribes. Parents charged include actresses Lori Loughlin and Felicity Huffman. Representatives for Loughlin had no comment. Officials say parents spent anywhere from $200,000 to $6.5 million to guarantee their children's admission. Loughlin appeared in the ABC sitcom "Full House," and Huffman starred in ABC's "Desperate Housewives." Both were charged with conspiracy to commit mail fraud and wire fraud in indictments unsealed Tuesday in federal court in Boston. Court papers say a cooperating witness met with Huffman and her husband at their Los Angeles home and explained the scam to them. The cooperator told investigators that Huffman and her spouse "agreed to the plan." Huffman is married to actor William H. Macy. Messages seeking comment have been left with representatives for Huffman and Loughlin. College coaches and others have been charged in a sweeping admissions bribery case unsealed in federal court. The racketeering conspiracy charges unveiled Tuesday were brought against the coaches at schools including Wake Forest University, Georgetown and the University of Southern California. Prosecutors allege that fake athletic profiles were also made to make students look like strong high school athletes when they actually weren't. Federal authorities have charged college coaches and others in a sweeping admissions bribery case in federal court. The racketeering conspiracy charges were unsealed Tuesday against the coaches at schools including Wake Forest University, Georgetown and the University of Southern California.